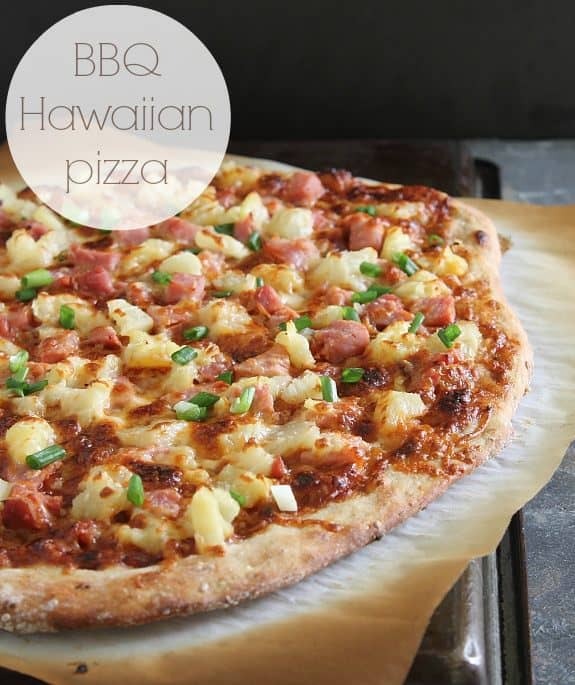 Three recipes to use leftover ham from any holiday dinner including a quesadilla for breakfast, ham salad for lunch and a BBQ Hawaiian pizza dinner recipe. When you think of holidays that produce massive amounts of leftovers, I’m guessing everyone’s mind immediately goes to Thanksgiving. Am I right? Maybe it’s just my family, but Easter gives T-day a run for it’s money in the leftover department. Different meat, same level of fridge inundation. 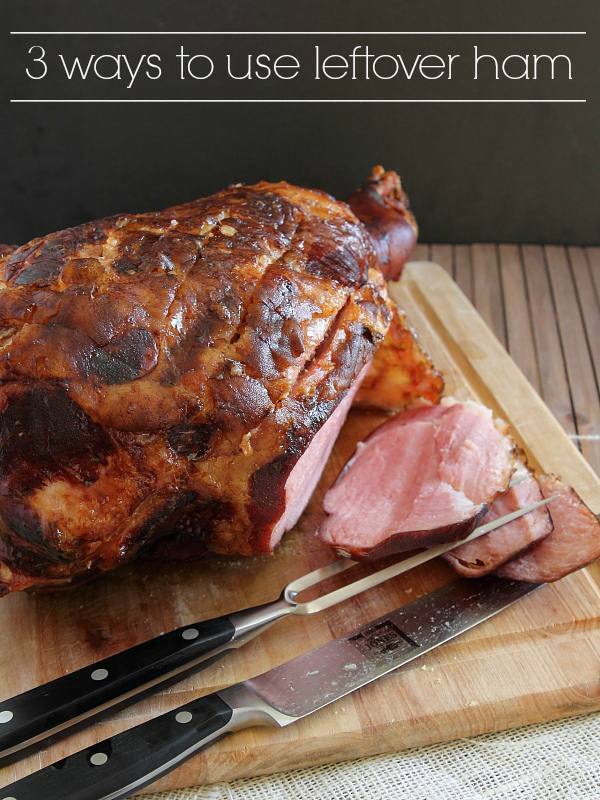 We’ll be eating week old ham for Easter this year because this delicious Jones Dairy Farm smoked ham was made last week so I could throw together some breakfast, lunch and dinner ideas for you guys using the ham leftovers. Breakfast is an easy meal to sneak some leftovers in but instead of the typical omelet or scramble, how about a cheesy quesadilla to get the day started? Chopped up leftover ham is basically a thicker version of Canadian bacon, right? Seems fitting to use it in a breakfast quesadilla when you think about it that way! Ok, google ham salad and then come back here. Ready…go. I’ll wait. NASTY right? I don’t know what it is but when mayo meets a pinkish kind of meat, that’s just something I don’t want to touch with a 10 foot pole. So, this ham salad is a bit different. 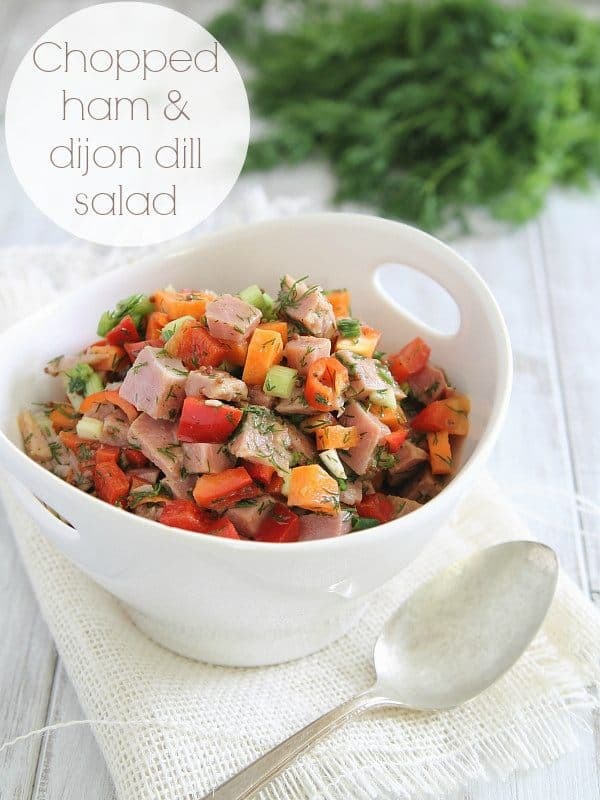 Theres lots of fresh chopped veggies and a tangy dijon dill dressing that complements the saltiness of the leftover ham really well to make a healthy lunch salad. I happily ate this with some toasted pita bread for lunch for a few days in a row without tiring of it. Gotta give it to the Hawaiians, they knew what they were doing with the whole pineapple and ham thing. This version of the classic pairs it with some smoky BBQ sauce for a double smoked result that’ll have you licking your fingers. 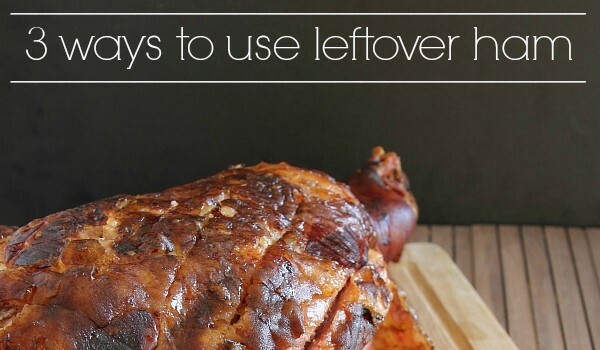 You can find the leftover ham recipes below and hopefully this gives you some new ideas on how to use up that ham roast from your next holiday meal! If you’re looking for even more leftover ham recipes, also try these Mini Ham Cheese and Spinach Breakfast Pies or this Roasted Sweet Potato Apple Ham Sandwich! Whisk the eggs and milk together in a small bowl. Heat a skillet to medium and grease with butter or cooking spray. Once hot, add the eggs to the skillet and scramble. Transfer to a dish and set aside. Add a bit more grease to the skillet and lay the tortilla flat in the pan. Sprinkle most of the cheese over the entire surface of the tortilla, then transfer the scrambled eggs onto one side of the tortilla. Place the chopped ham and green onion on top of the eggs and season with some black pepper. Top with the remaining cheese and fold the tortilla in half. Press down with a spatula and cook until the cheese is melted and the bottom starts to brown. Transfer to a cutting board, slice into thirds and serve. Combine all the salad ingredients in a large bowl. Whisk together all the dressing ingredients in a separate bowl and pour over salad. Toss until fully coated and serve. Preheat oven and a pizza stone (if using) to 500 degrees. Roll the dough out and spread the BBQ sauce evenly leaving a 1/2 inch border. Spread the ham and pineapple on top of the sauce and top with the cheese. Transfer dough to the pizza stone in the oven and bake for about 12 minutes until cheese is melted and crust is starting to turn golden brown around the edges. Remove pizza from the oven and garnish with the green onions. *Jones Dairy Farm sent me a ham and I was compensated for my time to share it with you. As always, all opinions, content and photography are 100% my own. I actually wasn’t planning on doing an Easter ham because 1. I’ll be entirely alone due to the fact that my husband will be working a graveyard and my family is in Canada and 2. I didn’t want leftovers for eleventy million years. Jk, now I do. Maybe I’ll make it just for leftovers! Pinned! Um, yeah, that ham salad looks wayyyyy better than normal ham salad. 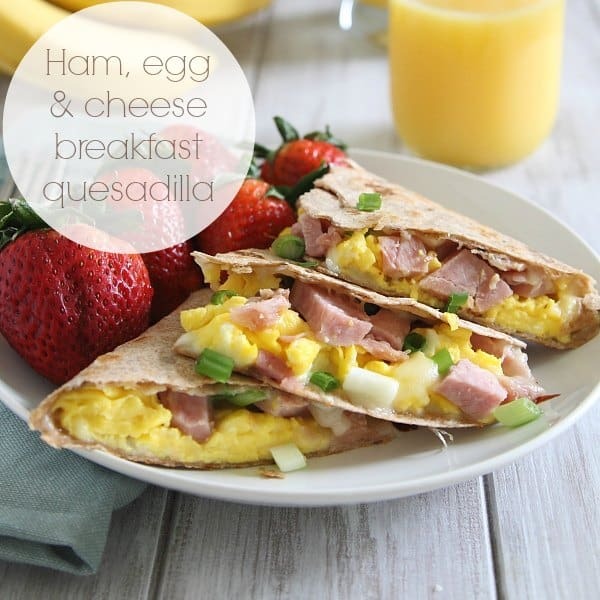 Ya forget the salad, the breakfast quesadilla looks so good. So easy to make too. That deserves it’s own page. I made the ham salad and loved it. I added orzo to make it a complete meal. Great recipe! Pingback: Quinoa Fried Rice – A great way to use leftover ham - Healthy. Delicious. I tried to click on the recipe posts but ads kept coming up. Ugh!! So frustrating because these look great! I love ham :D and all these ways are so delicious and may be it’s easy to make, right?